The Karma Chameleon singer - who earlier this year said he'd love to join the judging panel on the ITV series - said the talent contest was to blame for dumbing down music. Boy George claimed on new BBC2 show Secrets Of The Pop Song that Bowie's individuality would have been criticised on X Factor. He said: "You have got the audiences dictating the art form which is dreadful. Imagine what would have happened to David Bowie if he'd gone on X Factor. "They would have said, 'Lose the cape, honey', and 'The ginger hair isn't going to work!'" 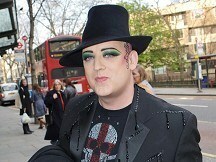 But 50-year-old Boy George once had ambitions of being an X Factor judge himself. He said in February: "I would be great but I'm not sure if they could handle me. "I'd do it but it depends how much they would pay me and if I could have Cheryl Cole's wardrobe budget." The former Culture Club singer also claimed in the new BBC2 show that the whole pop industry is flawed. He said: "It's all down to demographics, market research and target audiences, which isn't really what artistic things are about."